I'm kind of pleased to see this come to Dynamite, but (not to put a damper on things) I would prefer it if they gave a bit more consideration to the ones they already have. That may not be true of all titles; I don't buy the Warlord of Mars stuff or Vampirella (yet, anyway) and they still seem to get a fair bit of "push". But the books that drew me in in the first place (PSP, Hornet) feel like afterthoughts. Of course the company has to continue to grow, but my experience with the other books takes away my enthusiasm for the new ones. How long until Spider is shuffled aside for the next flavour of the month? Personally, I Love the costume design.... I'll definitely give the book a look. Maybe the powers that be at DE thought the original costume made him look too much like the Shadow?? I'm loving the design on The Spider, I'm really looking forward to reading this! 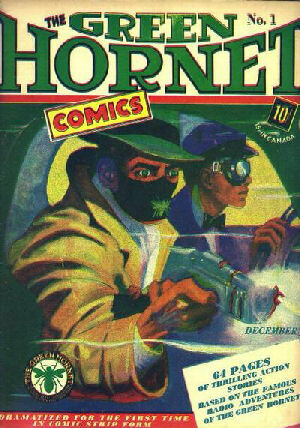 The classic look from Pulp Magazines, was always the best, and the movie serials from the 1940 was not really truly respecting the original Pulp character, like many other movie serials of that time (It's a curiosity but nothing more, and nothing to base new work on), with underpaid creators from the 1930's having little to nothing to say about the movies from those days. Last edited by Renaud; 08-20-2011, 08:25 AM. Last edited by Renaud; 08-20-2011, 08:27 AM. 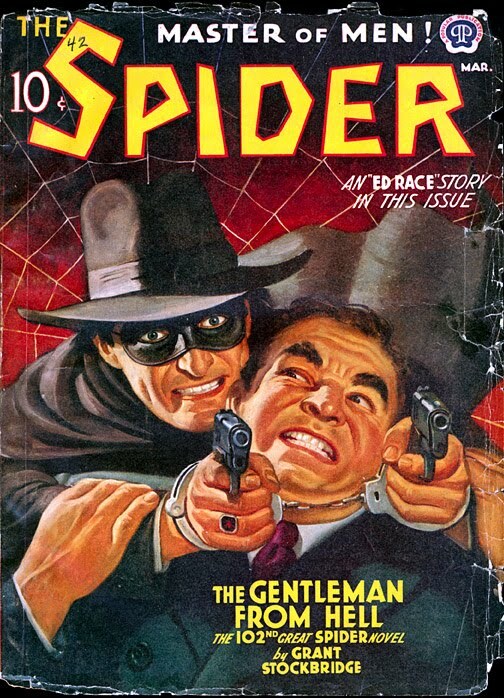 They wouldnt have ANY OF THAT, because they knew there was more to the spider than the pulp series it came from. They decided to homage derivative works aswell!!!!!!! Because like it or not, it was part of what the spider brought into the world as part of itself. Look, here's the thing, guys. Dynamite just acquired rights to both THE SHADOW and THE SPIDER. Now, if you look at the old pulp cover paintings, these guys could practically be twins. 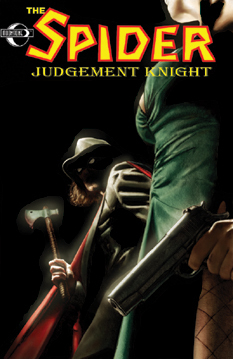 They both wear black suits, hats and capes, and both carry twin .45 automatics. The major difference is that The Spider wears a small domino mask, while The Shadow keeps his mouth covered by a red scarf (or part of his cape). The reason being that The Spider was created by a rival publisher to directly compete with The Shadow, and they went so far as to make him look as close to The Shadow as they could get (without being sued) on the covers. On the other hand, as described in the novels themselves, Richard Wentworth used makeup, fake fangs, a white fright wig and a false hump to create the fear-inspiring image of the ugly, hunchbacked Spider. The whole "ugly hero" thing just doesn't play well on covers (and in comics), which is why original publisher Popular Publications didn't use that image (with the exception of about 7 covers). Now, with Dynamite publishing both characters, it makes perfect sense for them to want to differentiate them as much as possible. Therefore, Dynamite chose to update The Spider to modern times, and use a costume inspired by the old movie serial, while keeping the look of The Shadow (whose image is well-established in comics, going back to the DC comics series by Mike Kaluta in the early 1970s) traditional. Also, The Spider is still being published by Moonstone Books, where they are using the traditional domino mask along with the wig (black this time) and fangs -- no hunchback. Last edited by positronic; 09-08-2011, 02:18 AM. Rare? I doubt it. I just ordered a copy from Moonstone last week. 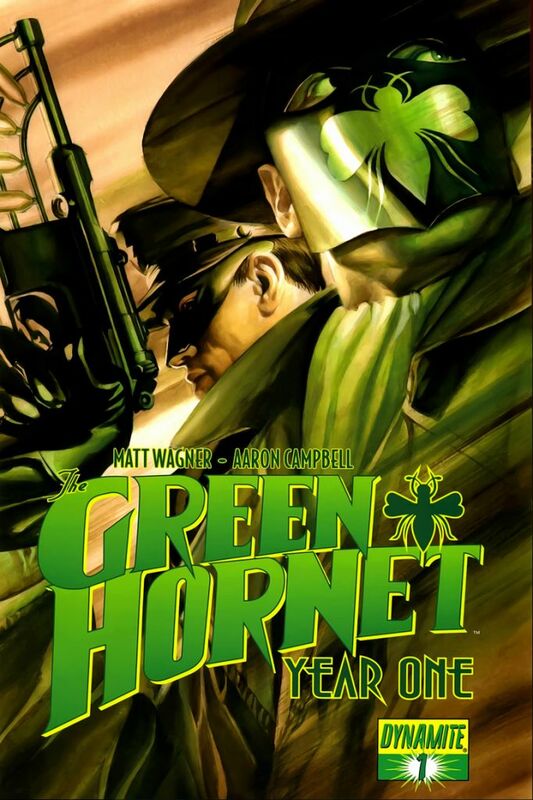 But Dynamite also based the look of GREEN HORNET YEAR ONE on the costume from the movie serials, and yet you don't seem to have a problem with that. Actually, the two Spider serials were some of the better adaptations ever made in movie serials, speaking as someone who has actually seen them. 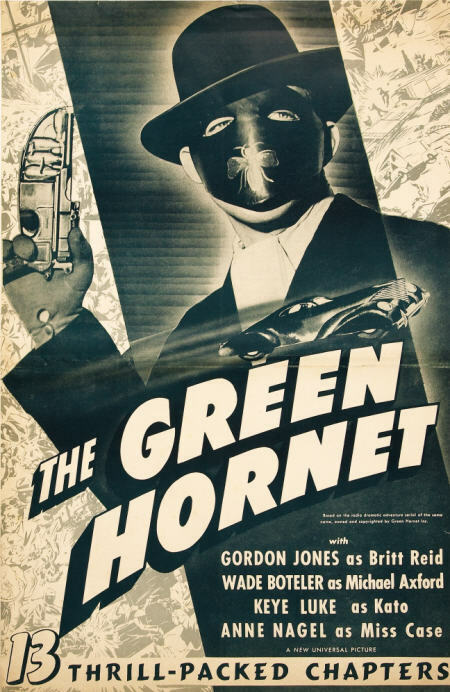 A better serial adaptation than The Shadow, which was made a couple of years later. The Spider's Web, the first serial from 1938, was ranked by The Serial Squadron [http://www.serialsquadron.com/] 10th best out of 266 sound serials. Last edited by positronic; 09-08-2011, 02:45 AM. An event worthy of the great classic heroes. Last edited by Renaud; 09-08-2011, 11:50 PM. Last edited by Renaud; 09-08-2011, 11:45 PM.